Take I 91S to Exit 20 Country Club Road. Take a left at the first stop sign and a left at the second stop sign. This will take you over I 91. Follow Country Club Road for approximately 1 mile until you see Moody School on the left. The field is behind the school. Park in the lot to the left of the school building. Take I91 North to Exit 20 Country Club Road. Take a right at the stop sign and proceed approximately a mile. You will see Moody School on your left. The field is behind the school. Park in the lot to the left of the school building. 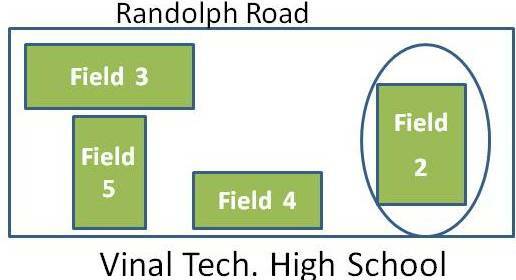 Directions: There are 4 soccer fields used by MYS at Vinal Technical High School. Please see below for field lay out. Field 2 is a 11 vs 11 field, typically used by the U15 to U12 divisions. Field 3 is a 11 vs 11 or 8 vs 8 field, typically used by the U10 division and as a shared field for the U6 division. Fields 4 and 5 are 8 vs 8 fields, typically used by the U8 division.